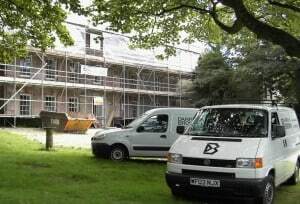 When it comes to specialist restoration and conservation work, few builders can claim the expertise and experience of Cornwall’s Darrock & Brown. The Bodmin-based company focuses entirely on the historic and heritage sector, including Grade I and Grade II Listed Buildings. It has worked across the UK and as far away as Ireland, but mainly accepts projects in the South West. To be more precise, the company’s vehicles mostly run on Texaco diesel, although they can also be refuelled at supermarkets – Tesco, Morrisons, the Co-Operative – and at Moto service stations. Darrock & Brown’s drivers each carry a Texaco Fastfuel card, supplied by Fuel Card Services. It means that they can pull into any of more than 2,000 sites nationwide, fill up, present the fuel card, then drive off. No paperwork, no administration, no delays, no need to carry cash. Darrock & Brown originally chose the Texaco fuel card, after comparing it with everything else available, for the savings and convenience. The fixed weekly pricing means that it pays, typically, up to 4p per litre less than national average pump prices. It receives a single VAT-compliant invoice by email each week, covering all refuelling for all vehicles, with payment being made automatically by direct debit. The interval between filling a tank and payment means anywhere up to two weeks of interest-free credit. If Bill has a query, he can access the firm’s account 24/7 via secure Internet, and examine any transaction in detail. That even includes refuelling which has yet to be invoiced. Custom reports are available at the click of a mouse, ready to drop into standard office packages. Mostly, though, he calls Donna on her direct line. Darrock & Brown has built an enviable reputation for the quality of its restoration work, on everything from the smallest Holy Well to Truro Cathedral. Its insistence upon high standards can be seen in historic houses, churches, monuments, copper and tin mine ruins and more. It demands the same high standards from its suppliers.